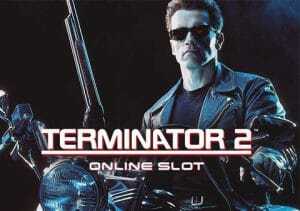 Terminator 2 is a 5 reel 243 ways to win slot game brought to you by Microgaming. Playable from 30p to £30 a spin, this game is based on the 1991 blockbuster film (Terminator 2 – Judgment Day). Starring Arnold Schwarzenegger, it was directed by James Cameron and became a worldwide hit. If you haven’t watched the film I’m sure you will be familiar with phrases such as ‘Hasta la Vista baby’ and ‘I’ll be back’. The blockbuster movie is about Sarah Connor and her son John who are trying to get away from T-1000 – this robot has been sent back in time to kill John as he is to become the leader of the human resistance against machines in the future. Arnie (T-800) is also sent back in time to protect John from T-1000. It’s an action-packed classic! The film is encapsulated brilliantly in the slot game as you will see clips from the film as well as futuristic graphics and animations. The effects of the overlays on the reels and symbols as well as the robotic animations are simply brilliant – just like the Microgaming-powered The Dark Knight Rises slot. On to the game now – a spin that doesn’t win you anything may (at random) trigger the T-800 Vision feature. This gives you the Terminator’s viewpoint as he scans for targets to destroy. Look out for high end character symbols as these reward you with cash prizes. The T-1000 symbol represents the biggest win but what you want is the scatter symbol as only 1 will allow you to play the Free Spins feature. Here you get 10 free spins – however, there are more chances to win as the free spins feature encompasses a 5×4 reel set with 1,024 ways to win. The T-1000 symbol is all important as it will transform when part of winning free spins combination to another character symbol – it will give you the best (and most lucrative) symbol possible to give you the maximum winning amount possible on that spin. I really like Terminator 2 – graphically its brilliant and a film I like which helps. I found it to be a medium variance slot with decent wins possible. The base game didn’t really give me wins over 20-30 times my stake but the T-800 Vision feature is a little more rewarding with more than 125 times your stake possible. The big winning amounts will almost certainly be won in the Free Spins feature – there’s a whopping 2,950 times your stake to be won. You would need the T-1000 symbol to appear on a few free spins to make that feature give you anything substantial. The only downside is that you cannot trigger more free spins. If you like branded slots, you cannot go wrong with Jurassic Park (also by Microgaming). However, if you want movie-inspired slots, you should definitely play the Marvel titles by Playtech with The Avengers and The Incredible Hulk being brilliant.